Razer is getting ready for round two. Following the first real gaming smartphone named simply, Phone, they have introduced the - surprise - Phone 2. Don't be fooled by its lackluster name though: the Phone 2 is everything but boring. Let's take a look at what the brand-new gaming smartphone can do and what its weaknesses are. Razer is perhaps one of the best loved brands among gamers and one of the most distinctive with its neon green snake triskelion logo becoming a defining hallmark for quality gaming hardware. They’ve expanded from making just mice, keyboards and headphones to gaming notebooks like the eponymous Razer Blade and even phones including one of the first purpose-built gaming phones in the form of the first Razer Phone though the Blade and Razer Phone weren’t officially available in Malaysia when they first made their debut a while back. Fortunately, Razer is bringing in their latest incarnation of the gaming phone writ large, the Razer Phone 2 to Malaysia today. But with a big, black design and a glowing RGB logo on the back, not to mention the massive front speakers, the Razer Phone 2 definitely has a vibe you won't get on any other flagship. If it appeals to you, you'll likely also love the easy software customisation and the general style the phone brings to Android, and you'll get the most out of your mobile games too. Much like its predecessor, the Razer Phone 2 offers up a unique proposition. You, the user, want a smartphone with a display with a refresh rate that out-performs every other phone in the world. You also like to play games and blast audio directly at your face, not bounced off your palm or a nearby wall. The Razer Phone goes so far as to assume you want a notification light of many colors shining out from its backside. Short battery life and just OK photos undermine what is otherwise an amazing phone. The gaming experience is good however; you’re very much at the mercy of the developers and what they bring to the platform. I also can’t really help but think it’s a solution for a problem that doesn’t really exist… if you assess it as a stand alone phone it’s actually very good, I’m just not sure that it’s $1300 + good. A niche proposition has some excellent features – including fast refresh rate screen and illuminating rear logo – but a design that can't hold its own against the current crop of flagships. As a stand-out device with points of difference it's sometimes brilliant though. Clearly the Razer Phone 2 is not for everyone. Much like a Razer Blade laptop isn't meant to be as popular or universally appealing as a Macbook. And we're not just talking about a "gamer" price premium here. The fact of the matter is that most people don't really care about a 120Hz display or want an RGB Chroma logo on the back of their phones. Which, of course, is perfectly fine and well understood by the likes of Razer. I enjoyed my time with the original Razer Phone. That was quite large in the hand due to its “brick” design. So I was very interested to see what the company had on offer in this second model. To have a look at the brand new telephone from Razer, particularly from the entrance, you wouldn’t actually know this was the Razer Telephone 2, it’s so just like final 12 months’s mannequin – Razer is clearly channelling its inside Apple or Samsung, with daring confidence within the authentic’s design.Heck, even Apple has launched a brand new coloration possibility on this 12 months’s iPhone XS vary – with the Razer Telephone 2, you get black with a mirror end or black with a matte end. The Razer Phone 2 is a great phone for gamers, but just OK for everyone else. That unfortunately leaves the Razer Phone 2 in the same place its predecessor was at last year—relegated to niche status for a few select users with the hopes that next year finally brings its breakthrough. Priced at $799, the Razer Phone 2 is one of the few high-end flagships you can buy this year at the sub-$1,000 price point. It improves on the original Razer Phone by adding IP certification, wireless charging, and is still fantastic for gaming. It's an excellent flagship choice as long as your main priority isn't the camera. Impeccable performance and the smoothest screen you'll find on Android, now improved with a design that's slightly more forgiving on your palms. It's still niche, though, and the higher price does it no favours. The Razer Phone 2 is far from a reinvention, and if you weren’t a fan of the original this is unlikely to convince you otherwise. Instead, Razer has doubled down on its idiosyncratic design choices and backed it up with flagship features like waterproofing and wireless charging - along with a few novelty LEDs. A short battery life and just OK photos undermine what is otherwise an amazing phone. The Razer Phone 2 is a 0.5 refresh rather than a complete reimagining of the original ‘gaming phone’. It doesn’t have the immediate wow factor of the original as a result. The Razer Phone 2 is far from a reinvention, and if you weren’t a fan of the original this is unlikely to convince you otherwise. Instead Razer has doubled down on its idiosyncratic design choices and backed it up with flagship features like waterproofing and wireless charging - along with a few novelty LEDs. The Razer Phone 2 isn't a re-imagining of the gaming phone, it's merely just an iteration. The cameras and display have been slightly upgraded, and it now has a glass back, wireless charging and a light-up Chroma logo - but also a higher price tag. Looking down at the glowing black box on the conference table in Razer's San Francisco offices one thing is already clear: The Razer Phone 2 is a better device than the gaming phone the company debuted a year ago. Mostly, because the brick I'm looking at isn't actually the phone itself, but a wireless charging brick outfitted with a bright ring of colorful LEDs. The Razer Phone 2 delivers a similar key spec to its predecessor, ensuring top-end 120Hz gaming, while dangling gamers' favourites from the brand such as that light-up LED Razer logo. It's a better phone for its advances, but ultimatey it's still a brickphone dressed in glass clothes. Going back a year or so in time, there was a lot to love about the original Razer Phone. The same goes for the new Razer Phone 2. In fact, many of these lovable traits are shared between the two models. The key difference here seems to be that Razer has been working hard over the last year to make the new model better by address the key issues the previous model had and most importantly, on making it more appealing as an overall package. 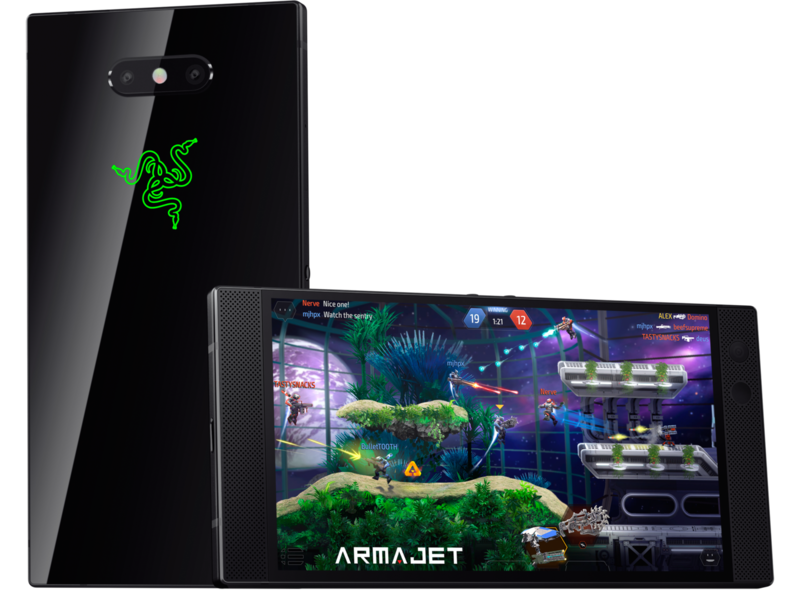 When Razer announced its Razer Phone as a 'gaming smartphone', a sizeable number scoffed at the idea - how can it be a gaming smartphone if everyone has the same flagship hardware? In Razer's own words, they were 'carving a new market' , with features like a 120Hz Ultramotion display and HDR, as well as a special fast chip under the hood. Razer says it easily met their sales expectations, and they are ready to announce the Razer Phone 2, a refined model with a number of extra requested features. Prise en main du Razer Phone 2 : non, il ne s'adresse pas qu'aux gamers ! 5.72": Bu boyut akıllı telefonlar için biraz büyük sayılsa da, artık oldukça yaygın. Büyük ekran boyutları yüksek çözünürlükleri mümkün kılıyor. Bu sayede yazım boyutu da büyüyebiliyor. Öte yandan küçük boyutlarda güç tüketimi azalmakla beraber; cihaz boyutu ve ağırlığın yanı sıra fiyat da ucuzluyor. 0.219 kg: Akıllı telefonlar için tipik ağırlık.